'On the Move Caravans' create the finest quality caravans on the market. The commitment to create something different has enabled the manufacture of a range of vans to suit all travellers needs. Whether you're a fisherman, an off-road enthusiast or just the happy traveller wanting to see our vast country, we have a collection that is sure to satisfy your travelling requirements. Our team of quality craftsmen endeavour to create your ultimate travelling holiday package on wheels. There is nothing spared when it comes to quality from On The Move Caravans. Royal Flair Caravans philosophy of 'small details make a big difference' consists of attention to finishings, fabrics and textures that detail a pursuit of quality that not only resonates in the final design, but the customer service that follows as well. This attention to detail allows Royal Flair to provide its customers with a superior caravan and user experience. 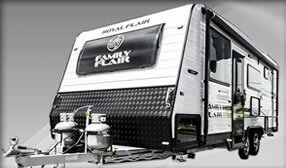 Whether you're purchasing for the first time or upgrading to a newer model, Royal Flair will strive to deliver a truly unique caravan using the very best of todays interior design ideas and light weight, durable materials. Pre Owned Caravans & Pop-Tops! A quality Pre Owned or used caravan is a great alternative to a new caravan and we have a great range to choose from. All of our used caravans are workshop inspected to ensure their of the highest quality! 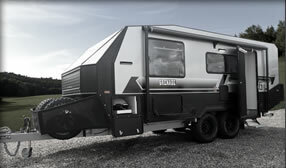 We always keep a great range of used off road caravans, used bunk caravans and used ensuite caravans in stock. If we dont have what you are looking for, then we can find it for you. We also consign and buy caravans, so if you want to sell your caravan, give us a call on 0450 690 166 or 0421 317 528. Sell your caravan quickly and simply to Caravan HQ!